Conservative Texture Management: Turns on and off conservative memory management for bitmap texture files. Performance will improve when this is enabled. If disabled, you will have a better on-screen rendering of bitmap files at the expense of slower performance. Smooth Textures: Smooths out the pixels of bitmap images when zooming in; this improves bitmap image quality. Alternate Gradient and Cutter: This is an alternative way to disable write in the OpenGL Backbuffer, required for some video cards (i.e. GeForce FX5200). Do not enable this option unless you are experiencing problems with gradients and cutters in OpenGL. Support Triple Buffer: Enable this option for a better compatibility with Windows Vista if your video card driver does not allow to disable the triple buffering option. Not enabling this option may result in a dashing line when drawing a brush stroke. Support Desktop Effects: Enable this option for better compatibility with Windows 7, Windows Vista and Mac OS X desktop effects. This will prevent graphic compositing problems from happening when the full-scene anti-aliasing option is enabled. Enable Mipmapping on Bitmap Layers: Generate anti-aliased mipmap textures. Disable this option for increased performance when working on Bitmap layers with non-standard graphic cards. Maximum Texture Size: The size that the bitmap file will be reduced to when using the Conservative Texture Management. Texture Memory: The amount of temporary memory used to store bitmap texture files. Vector Drawing Maximum Texture Size: This is the size that the .tvg file will be reduced to for better performance when in OpenGL render mode. The following options allow you to configure the way drawings are previewed in Harmony. Enable (Requires Relaunch) : By default, drawings displayed in Harmony, such as in the Camera or Drawing view, have no antialiasing and display hard pixels at the edge of strokes and lines. If this preference is enabled, antialiasing will be done through the graphic card to enhance the quality of drawings and make a preview that resemble the final render more closely. This may impact application performance negatively. Number of samples: The amount of times the OpenGL preview is scaled up before processing it for antialiasing. The higher this value is, the better the antialiasing quality will be but the heavier it will be on the machine's resources. NOTEIt may be necessary to restart the application to see the effects after changing either of these settings. NOTEThese settings may be overriden by the 3D antialiasing settings of the driver for your graphics card. If changing these settings and restarting the application seems to have no effect, make sure your graphics card supports antialiasing, that antialiasing is enabled and that it is configured to let applications control their antialiasing. NOTEThese settings only affect the way drawings are previewed in OpenGL. They have no effect on the final rendered image, or on the way the image looks when setting the Camera view in Render Preview mode. Enable Playback Caching: Enable the caching of OpenGL previews for quick playback. Playback Cache Size (in Mb): The maximum size of the cache used to store cached playback images. Enable Textures in Pencil Lines: Controls whether textures applied on pencil lines are rendered for the OpenGL preview. Enable Variable Line Thickness: Controls whether lines with a variable width are rendered with their variable width or with a constant width in the OpenGL preview. Enable Tone and Highlight: Controls whether Tone and Highlight effects are rendered in the OpenGL preview. Enable Cutter: Controls whether Cutter effects are processed for the OpenGL preview. Enable Colour Override: Controls whether Colour-Override effects are rendered in the OpenGL preview. Enable Rendering Caching of CacheLock Nodes: Controls whether OpenGL Cache Lock nodes are used to generate the OpenGL preview. Disabling this preference has the same effect as disabling all OpenGL Cache Lock nodes in the scene. Cache Capacity of CacheLock Nodes (in Mb): The maximum amount of cache available to store preview images cached by OpenGL Cache Lock nodes. This cache is stored in the graphic card's video memory. If your machine has a lot of video memory, increasing this setting could enhance the performance of Harmony when working with heavy scenes. Enable Rendering Caching of Composite Nodes: Controls whether non-passthrough Composite nodes cache their composited image when Harmony generates an OpenGL preview. This is useful when the image generated by a composite is used several times in a scene, for example because a composite's output port is connected to several other nodes. If this preference is disabled, the composite will regenerate the preview for its node system for each of its outgoing connections. When enabled, the composite will generate the preview for its node system once, cache it, and output the cached image to its other outgoing connections. Cache Capacity of Composite Nodes (in Mb): The maximum amount of cache available to store images cached by Composite nodes. This cache is stored in the graphic card's video memory. If your machine has a lot of video memory, increasing this setting could enhance the performance of Harmony when working with heavy scenes. NOTEOpenGL Cache Lock nodes and Composites are only available in Harmony Premium. 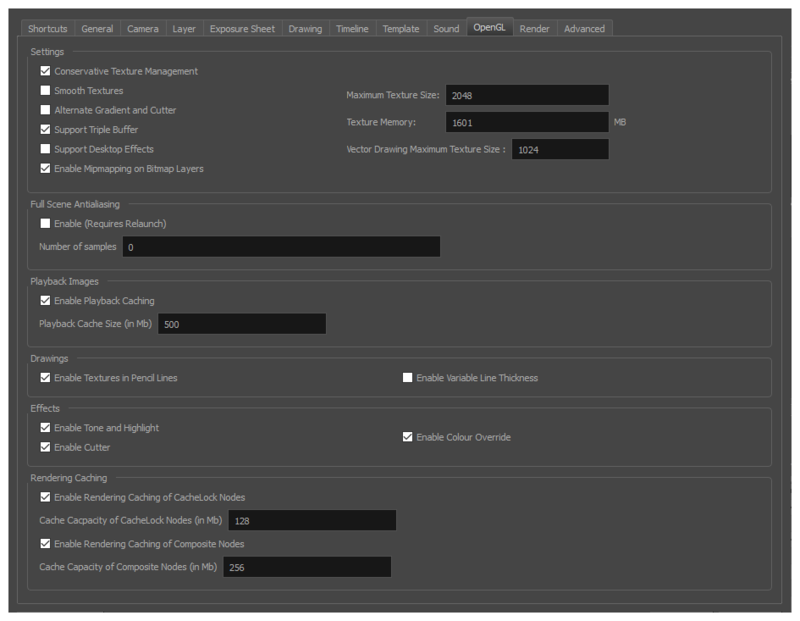 However, these settings may be useful if you are using Harmony Advanced to animate a scene created in Harmony Premium.